Microplastic and natural particles affect animals in similar ways, which makes evaluating the hazards of microplastics difficult, shows a new study by researchers from ACES and AquaBiota Water Research. These findings imply that unless we identify how and why microplastics differ from natural particles in their interaction with animals, we cannot be certain of how harmful they are. The study is published in the journal Current Opinion in Environmental Science and Health. “The environmental hazards of larger plastic debris in marine mammals and birds are today well established. Reports are now emerging, claiming similar adverse effects in smaller animals at the base of the food web. The problem, however, is that most of these experimental studies are flawed in their design, which hampers risk assessment and inflates public concern on loose ground,” says Martin Ogonowski, researcher at ACES/AquaBiota Water Research, and lead author of the paper. 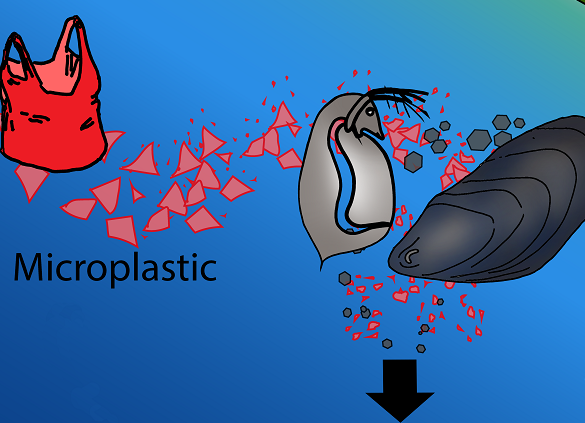 The sort of effects observed in animals exposed to microplastics are often related to changes in food intake, which leads to altered growth and reproduction. In a critical review, the researchers compared the effects reported for microplastics with those of natural non-food particles, such as clay. In the literature, they found that exposure to either type of particle results in similar effects but those by microplastics generally arise at lower concentrations. Still, this does not necessarily mean that microplastic are more toxic than natural particles, because the experimental setups and test concentrations, in the reviewed studies, differ too much from each other. The team points out that since microplastics are only a minor part of the particles found in aquatic environments, and that animals are evolutionarily well equipped to handle microscopic non-food particles, it is important to use natural particles for benchmarking the effects caused by microplastics in experimental studies.“Based on our current knowledge, we cannot rule out the possibility that microplastics are more harmful than natural particles, but how harmful these effects are is questionable. Therefore, to correctly assess the hazards of microplastic exposure and exclude the potential bias of food limitation in our experimental studies, we need to identify how and why microplastics differ from natural particles in terms of their interactions with animals,” says Martin Ogonowski. The article “What we know and what we think we know about microplastic effects – A critical perspective” is published in the journal Current Opinion in Environmental Science and Health.